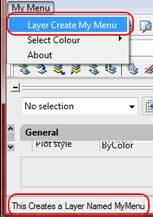 Last tutorial we created a basic AutoCAD menu. This tutorial we will look at adding help descriptions to our commandsto the AutoCAD menu file. You may have noticed that in AutoCAD there is a description box to the lower left of the AutoCAD program window. When you move your mouse over AutoCAD menu items or toolbars, a description to what the command is and does is shown to the user in this box. We will be adding these descriptions to our AutoCAD menu that we created last tutorial to help users understand what these new commands do. This is achieved by adding the ***HELPSTRINGS sub-section to our menu. 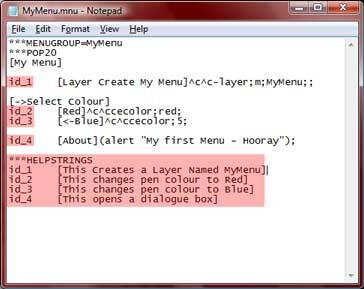 Open MyMenu.mnu in Notepad or similar program. AutoCAD understands that any text that prefixes the menu item names is an AutoCAD helpstring. In this case, I have sequentially numbered the HELPSTRING starting with id_1 and ending in id_4. The prefix can actually be named anything you want it to be named e.g id_1 could be called MyMenuHelp001 and the next helpsting could be called MenuHelpA - it doesn't matter what they are called, they don't even have to match or even be numbered. The only thing to make sure of is that the HELPSTRING name typed before the menu item name, also matches the HELPSTRING name in the ***HELPSTRING section. Refer to Fig.6 for more clarity. Notice in Fig.6, id_1 in the menu (written before [Layer Create My Menu] menu item name), also matches id_1 under the ***HELPSTRINGS section. Fig.7 Next we create a new AutoCAD section called ***HELPSTRINGS. Add the ID_# as shown in the HELPSTRING section as shown. The text in the brackets to the right is what is displayed in the description area of the AutoCAD status bar. You can write what ever you like here. However, keep it simple, not overly long otherwise the description may be truncated in the AutoCAD description box. To load/reload, Click Browse, locate the MyMenu.mnu file, Click OPEN, then click LOAD. Fig.7 to the left shows that when we now highlight over our menu, the description we wrote in the ***HELPSTINGS section of the AutoCAD menu now appears at the bottom of the AutoCAD window. This is not necessary for a .mnu file to work but can be very helpful for informing new users what a command does, or for describing commands that are perhaps unclear to the user.